Well, I knew it was going to happen. Once I made a decision to start blessing others, there was NO WAY I could wait until my actual birthday in September! So here we go – my 40th Birthday Project has officially started! Let the blessings begin! This evening as I was in the checkout line at Kroger, I overheard a conversation between the cashier and the lady standing in front of me. 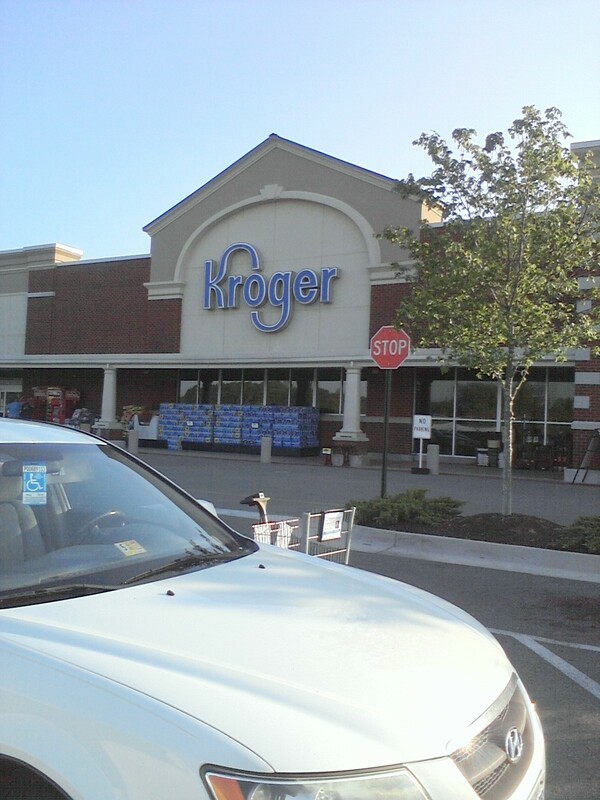 With a darling little girl bouncing in her arms, the lady swiped her credit card again only to receive another message of “Unable to authorize.” The Kroger staff was more than compassionate, offering to hold her groceries in cold storage while she called her bank to work out the issue. As she moved to the side to allow for my turn, my heart just went out to her. “Let me just get the things I need to make dinner tonight,” she said, as she and the Kroger manager started pulling items out of her bagged groceries. Of course you know what I did. How could I possibly resist? “Ma’am, just add those things to my groceries. I’ll buy your dinner tonight.” Yes, she was surprised. As was everyone now gathered around us, watching. “No, no, it’s OK,” she replied, “I have a little bit of cash in my wallet.” But she didn’t realize the importance of this moment. This was HER moment. HER time to be blessed. HER time to be shown love. Compassion. Kindness. And WOW – what a moment indeed! I bought the groceries she needed to make dinner tonight. And the grape soda she had in her hands. Because little things matter. I didn’t have any business cards with me, so I wrote my information on a slip of paper with a pen. I explained the premise of my birthday project: that she now has 40 days to bless someone else and comment on this blog about what she did. Even if she chooses not to visit this blog, I know that tonight was simply divine intervention. God wanted to bless this woman, and I was in the right place at the right time to make it happen. Even though I still have two and a half months before my 40th birthday, I am ready to start celebrating now! I simply adore birthdays, no matter the year. What a joy to celebrate YOU! Yes, YOU, the person reading my blog. YOU are special. YOU are worthy. And whether you realize this or not, YOU. ARE. IMPORTANT! Today I am laying the foundation for my 40th Birthday Project. My goal is to perform 40 Acts of Kindess to celebrate the 40 years I have been alive. I would like to say that my Acts of Kindness will be random, but really they are not. I’m already plotting my favorite things to do for others. Some are simple acts that cost nothing; others require money or purchasing items to complete the task. I guess the only thing random about my Acts of Kindness will be the people who receive my service or gift. I will choose 40 random people to bless with kindness, then provide them with a business card listing my blog URL and email address so they can in turn leave a comment about what THEY have done to bless others and pay it forward. I am almost giddy with excitement and anticipation of the kindness that will be shared again and again! I hope you are blessed by the posts shared on this blog. Kindness is inspiring, and if you leave this site inspired to be a little kinder to those around you… well, then, I guess my 40th Birthday Project was a success!